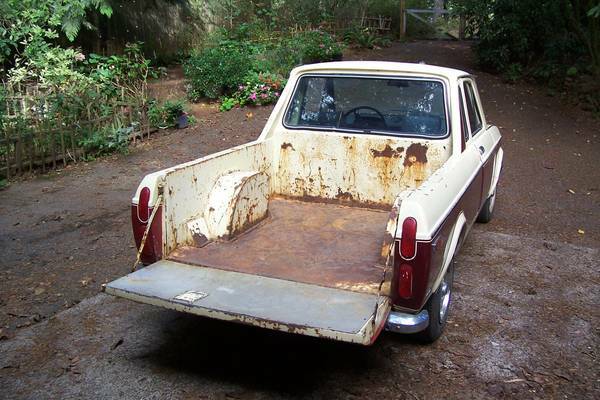 So if the Ford Squire from the other day is just too confining, a Subaru BRAT has too many seats in the bed, and a VW pickup is just too big, there’s really not much out there for you. Fortunately, you’re not the only one who felt that way, and that’s why one man, no, one visionary grabbed a Sawzall, did some surgery on a 128 wagon, and presto! Those of you complaining about the lack of available small pickups should be thanking this person. 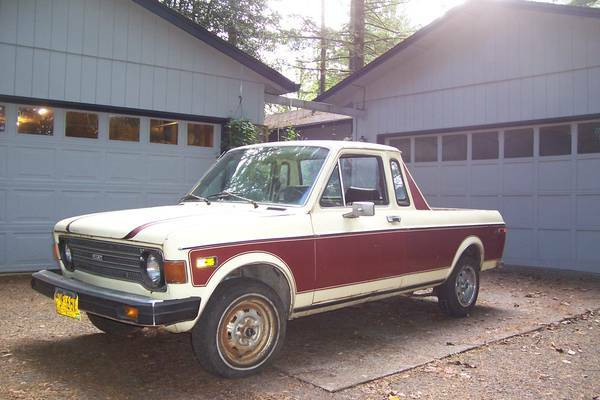 Check out this 1976 Fiat 128 Pickup for sale for $1800 in Washougal, WA. It’s guaranteed to turn heads at any Italian/oddball car show, as the only 128 pickups ever made were for South Africa, Yugoslavia, and perhaps some other southern hemisphere countries. This one is actually pretty convincing, coming fairly close to what a factory pickup would have looked like. Sure, some details are missing, like indentations in the bed metal for rigidity, and the rear lights look like off-the-shelf items from Frankie’s Import Car Parts circa 1983, but that’s offset by the small rear windows (Xtra Cab!) and the buttresses, no doubt making up for lost rigidity. It’s said to have a 4-speed manual, and to run and drive. The brake and fuel systems have been rebuilt – to what extent is unclear, but it does suggest this truck spent some time off the road. 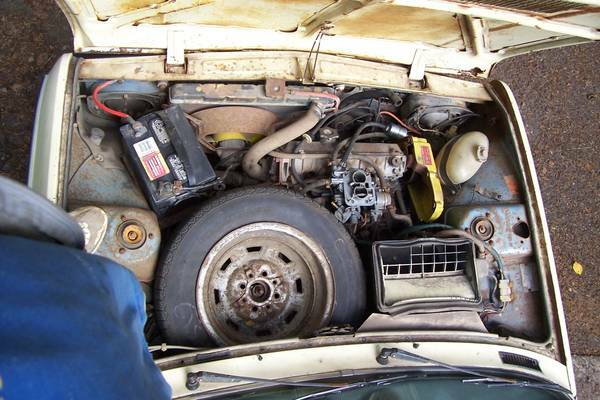 Unsurprisingly with an old Fiat, it’s said to be rusty, and does need further work. If you’re lucky, the conversion is all metal, and the visible rust is only surface rust. Front and rear bumpers don’t match, so once you get around to cosmetics, that might be a good first step. The engine looks a little dirty, and the cambelt cover is incorrectly installed, though the carb might just be clean enough that it’s a sign of a rebuild. Everything else is rather dirty, so you’ll probably need to replace things like the coolant hoses due to age, but structurally it looks decent. 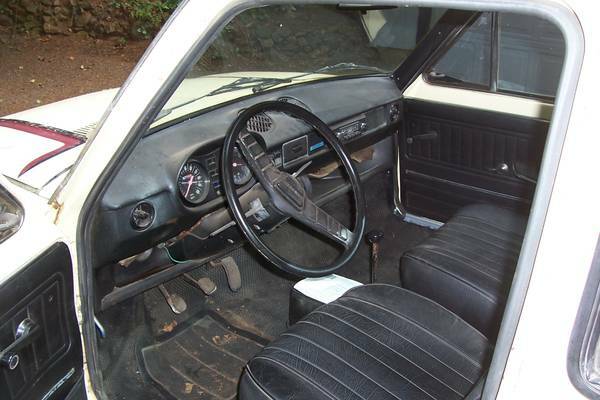 The interior looks amazingly good – a little dirty, but free of dash cracks, splits in the vinyl seats, and it looks complete and original down to the radio. Is there any way to get more black vinyl in this thing? Oh right, fill up the expansive bed with rolls of old upholstery. You can’t beat the rarity of this thing, and being a Fiat, even the simplest little truck will make a hauler that’s fun with the bed empty or full. This entry was posted on October 16, 2014 at 4:36 pm and is filed under Feature. You can follow any responses to this entry through the RSS 2.0 feed. You can leave a response, or trackback from your own site. When I was a kid there was an older guy in town who did something much the same to a mid 60’s Caddy, which looked almost factory made. I watched my neighbor butcher his recently passed father in law’s pristine 60 Falcon into a sort of Ranchero which my Dad bought for $50 a short while later; it did not look anywhere near factory. This car could be a nice resturation project. Is it sold?